Dalton, GA – MFG Chemical, LLC. is pleased to announce it has been recognized for exemplary efforts in improving its environmental, health, safety and security (EHS&S), as well as, employee training and engagement at its Dalton facilities by the Society of Chemical Manufacturers and Affiliates (SOCMA), the leading trade association representing specialty chemical manufacturers. MFG participates in SOCMA’s ChemStewards® program, which encourages companies to operate their facilities in an environment that guarantees safety and environmental compliance to all stakeholders. On December 5th at the 95th Annual SOCMA Dinner in New York City MFG accepted two Silver Performance Improvement Awards. 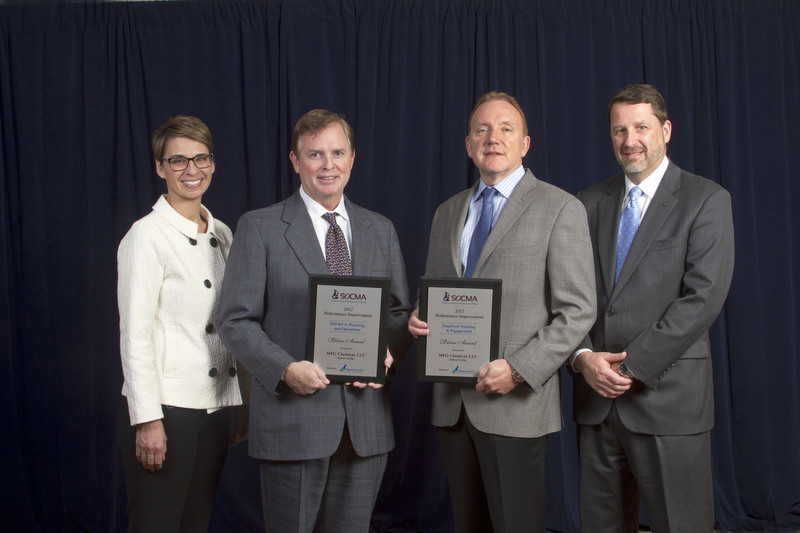 Keith Arnold, President of MFG Chemical, and Board member Paul Turgeon accepted the award on behalf of the company. MFG Chemical, Inc. is recognized for its successful efforts to improve its Product Stewardship and Employee Training. “Receiving such prestigious awards is testament towards the hard work our employees put in and will continue to do so every day. This award reflects our commitment to constant improvement for our products, our workers and our neighbors in the community,” said Keith Arnold. Contact: Daniel SanchezMFG Chemical, LLC.